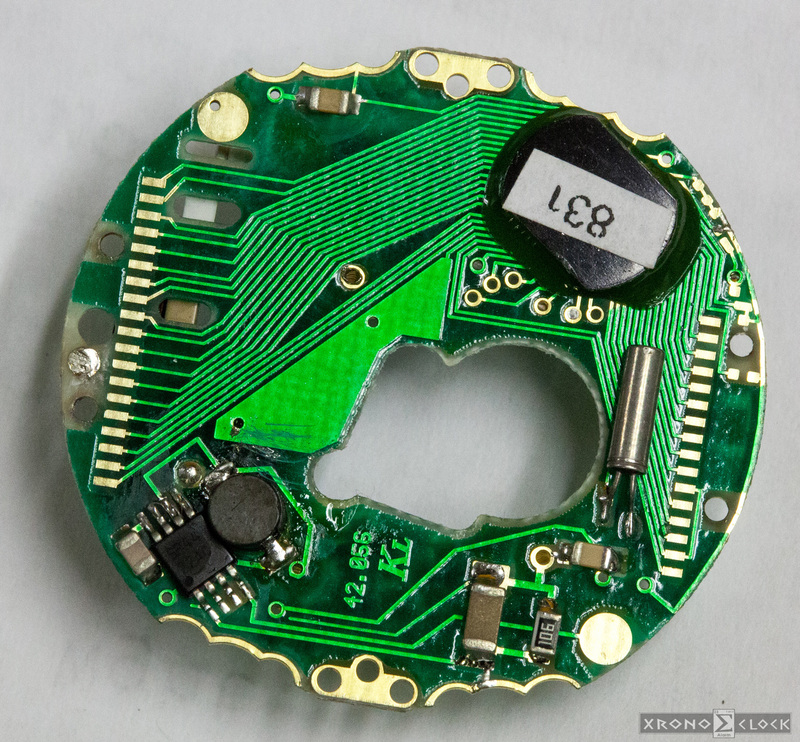 All the time I come across some really cool technology that I want to write about even tho it’s not related to Xronos Clocks. So I’m introducing “Misc Tech” category. Today I wanted to write about world’s smallest Geiger counter: PM1208 wrist watch made by Polimaster. I have some high resolution pictures of the insides of the watch at the end of this post if you are curious. I’ve always been fascinated by seeing “unseen” and radiation is just a thing. It all around us, it can kill us if levels are too high, but we have no way to sense it (at least not until it’s too late). So about 10 years ago I bought wrist watch that could detect gamma rays. Very expensive ($400) but also very cool! 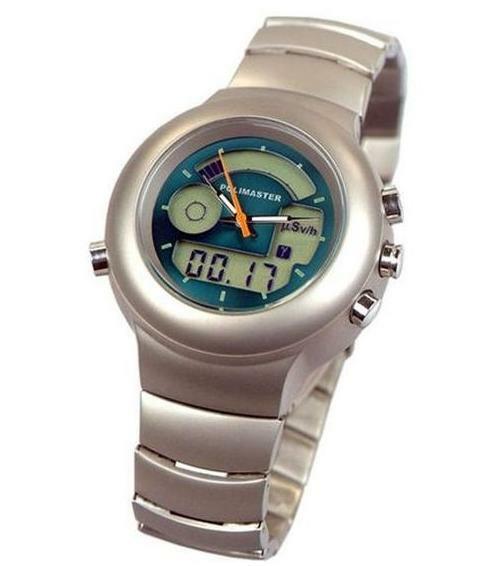 PM1208 (officially called Gamma Wrist Indicator) is big round, silver color wrist watch with metal body and bracelet. It’s very bulky, heavy and unique looking wrist watch. It has quartz clock hands mechanism as well as digital time indicator which also doubles as display for radiation level. Watch also has audible alarm which can be set to sound at specific gamma rate levels. It’s also waterproof for up to 100m. Dose rate is displayed in μSv/h units. 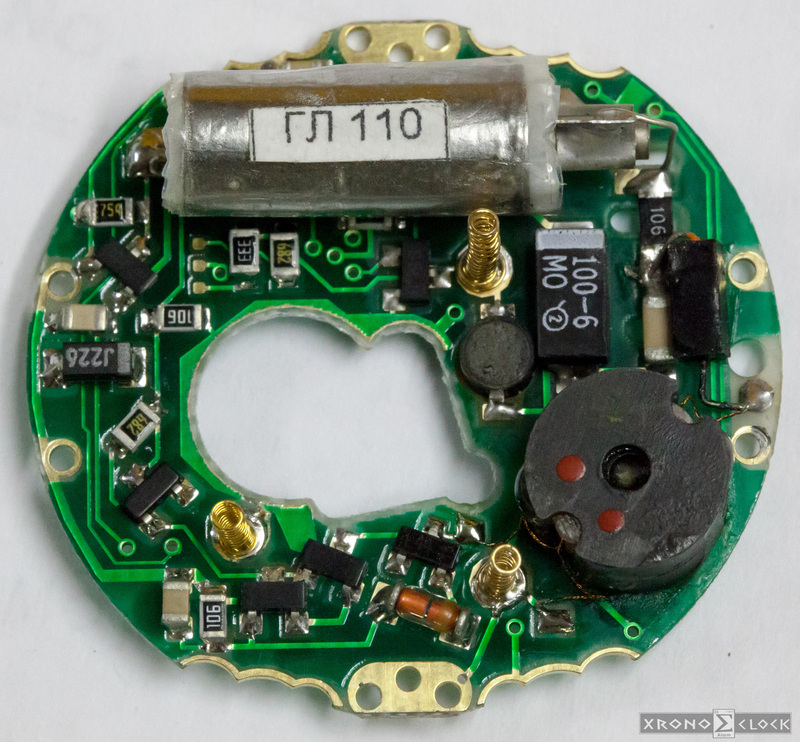 Geiger counter part is powered by a regular CR2032 3V battery which lasts about a year ( I was able to confirm this), while quartz clock is powered by another (smaller batter) which lasts much longer. I’m not going to bore you with all the specs, you can find out more on the official site. I was immediately amazed by how sensitive it was. 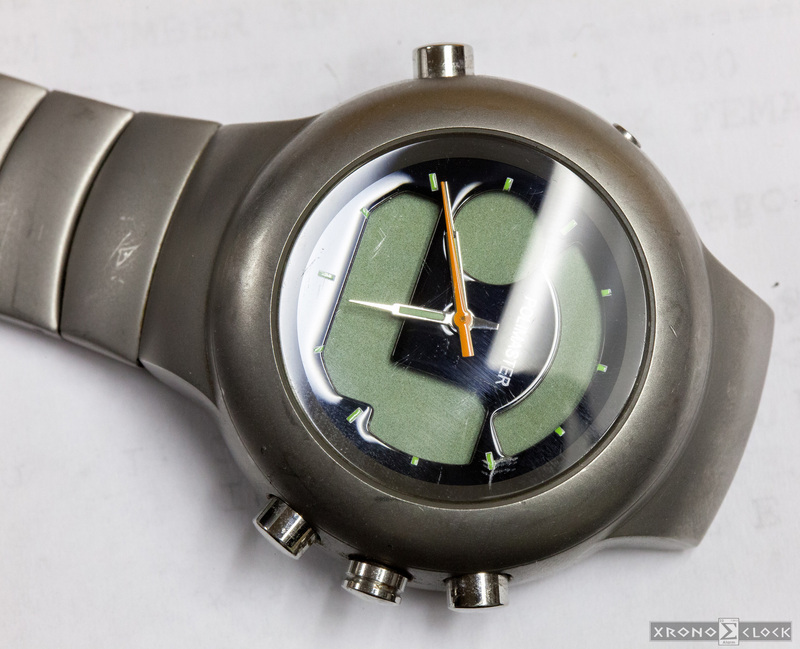 Watch would display background radiation at constantly changing rate. It was usually higher during day, and lower during night. I’ve encountered few places where gamma would be slightly higher that in other places for no apparent reason. At one point I had pain chest and my doctor sent me to cardiologic clinic for a checkup (don’t worry, everything was fine). They did what’s called a Radionuclide Scan. It’s a procedure when they put tiny amount of radioactive isotope in your blood stream and monitor it’s flow to see if anything is obstructed. Even tho radiation level was supposed to be almost negligible, I was “glowing” to my gamma watch. In fact I couldn’t wear it for about a week, it would start beeping every time I came close to the watch. LCD Display on the clocks has a very unusual bluish tint. This is actually typical of Russian made liquid crystals. Otherwise it’s same exact in any other digital wrist watch. To be honest, novelty part of having gamma counter on your wrist wore off in about a year. At that point I switched to lighter wrist watch and left PM1208 in the drawer most of the times. I still did wore it occasionally. Unfortunately after about 3 years later my PM1208 stopped detecting any radiation. 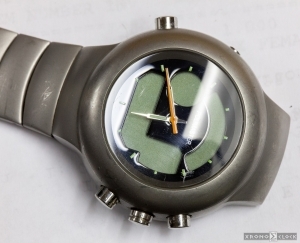 Watch part still worked and showed time, but neither replacing batteries or resetting “CPU” did anything to bring gamma detector back to life. Watch lay forgotten in the drawer for another 2 years. After 2 years, for some reason I decided to give another try and opened watch again trying to find a problem. Not finding anything that was immediately visible, I replaced batteries and to my astonishment gamma detector beeped back to life! It worked for about 6 to 12 months after which time it stopped once again. This time no matter what I tried I couldn’t bring it back to life. I’m not sure exactly what happened, perhaps GM tube’s life was up, or high voltage circuit gave out, but at that time I had no measurement tools and sufficient electronics knowledge to figure it out. I’ve tried contacting Polimaster and was willing to pay for repair but to my disappointment they ignored every single e-mail I sent. Taking watch apart wasn’t too hard. 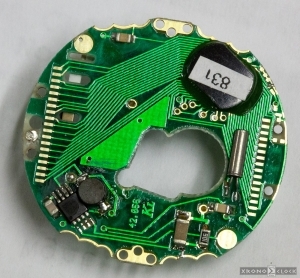 Previously I never attempted to take PCB completely out, as I was afraid to damage delicate components. And indeed it does look delicate inside. However after watch broke down for the second time I decided I had nothing to loose and took it apart. After unscrewing back (with universal watch opener tool) and removing battery holder clips I had to remove several tiny screws and PCB came out pretty easily. Below are the macro picture I took this morning (click on image to download full res). Immediately identifiable is the GM tube. 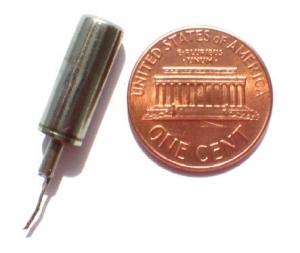 It’s largest part in the watch, and yet it’s tiny compared to other tubes like famous Russian SBM-20. I still don’t know how the heck it can be so sensitive in such small size! If anyone knows please enlighten me. GM Tube’s model name/number is mystery to me. It has a small label attached to it which has “GL110” written on it in Cyrillic letters. Google search did not return any meaningful results for “GL110″… Tube is actually SBM-21! 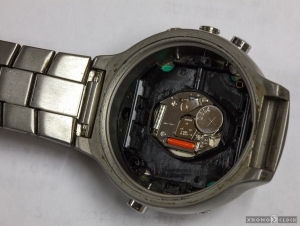 I’m still sad that watch broke, however I have hopes that GM tube in it is still operational. Possibly not the tube, might be a contact issue though. I have two of these exact tubes in my counters, and they are a lot more sensitive than the stock ZM1313. A way to tell is to put the watch on an AM radio, every time it detects a particle the radio will “click”. Version 3 firmware is here (Beta)! Xronos Clock Home - Update your clock firmware to V3 before DST end on Version 3 firmware is here (Beta)!